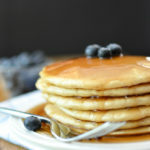 This extra fluffy, dairy free pancakes recipe is so easy to make with egg and almond milk. Can easily be made gluten free and vegan with a few simple swaps. Add milk, canola oil, egg and vanilla extract. Whisk until smooth. Preheat a non-stick griddle or large skillet to medium heat. (Coat pan with butter or oil if not using non-stick). Pour about ⅓ cup batter onto the griddle for each pancake. Allow it to cook until bubbles are visible throughout the pancake before flipping. 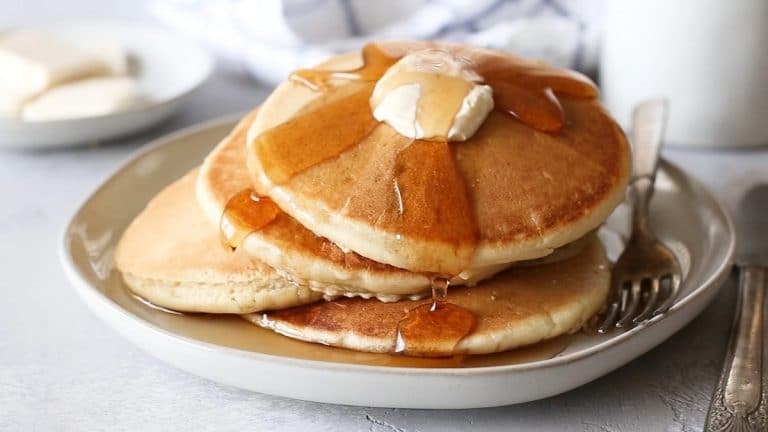 To keep cooked pancakes warm while the rest cook, place them in an oven set to 150˚F – 200˚F or on a plate tented with foil. *If you’re using coconut milk, use the kind from the refrigerated section because canned coconut milk is a little too thick.